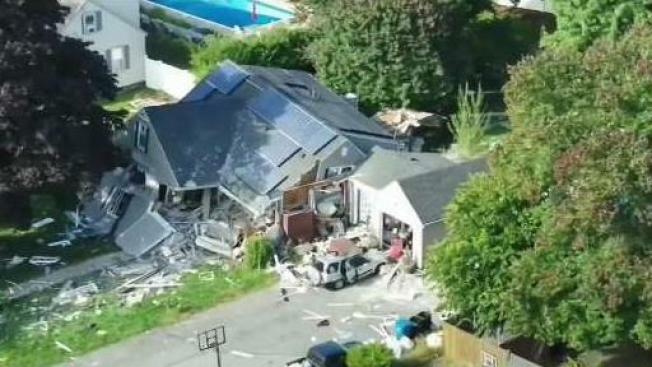 A Massachusetts family whose house was destroyed in a series of gas explosions and fires earlier this month in the Merrimack Valley has sued the utility that serviced their home. Attorney Socrates de la Cruz said the Figueroa family of Lawrence filed the lawsuit against Columbia Gas for gross negligence in connection with the explosion at 35 Chickering Road that injured their children and resulted in the death of an 18-year-old friend. "This family will never be the same," de la Cruz said. "This tragedy was preventable and it should have been prevented." The family consists of mother Omayra and her three children, including 21-year-old daughter Shakira Figueroa who was in the house when it exploded on Sept. 13 and underwent her fourth surgery on Thursday. Eighteen-year-old Leonel Rondon, a family friend, was sitting in a car in the driveway of the home when the explosion caused a chimney to fall on the vehicle, killing him. In addition to claiming Rondon's life, about 25 others were injured and dozens of homes and businesses in Lawrence, Andover and North Andover were destroyed or damaged in the explosions. "We are heartbroken about the family's loss and will continue to do what we can to help them at this terribly difficult time," Columbia Gas president Steve Bryant said in a statement Thursday. De la Cruz acknowledged that Columbia Gas has been helpful since the explosion, but the family still wants answers. "The Figueroa family and this community will rebuild, but an integral part of rebuilding is calling to account those responsible for this tragedy," de la Cruz said.